Believe it or not, the aesthetics of your roof are important to the curb-appeal and resale value of your home. A new roof, or a roof that is in good condition, tops the list of things that potential home buyers look for. While the aesthetics of a roof are hugely important, so is a functional roof! A roof provides protection from the elements and helps balance the temperature indoors during extreme shifts in temperature outdoors. So, if your roof starts to fail, essentially so does your entire home. Investing in the proper shingles and then having a professional properly install them is a commitment, so here’s our take on architectural roofing shingles. There are so many options of roofs and shingles on the market, it’s hard to discern what the best option is for you, the homeowner. Most roofing contractors would agree that architectural roofing shingles are worth the extra money because of the added benefits of increased curb appeal, weather resistance, and a better, longer lasting warranty. Architectural roofing shingles — also referred to as dimensional, laminated, or composite roofing shingles — have a different aesthetic compared to the traditional three-tab shingles most homes have. The physical difference is that architectural roofing shingles have a heavier base (50 percent heavier than three-tab) mat with multiple layers, and more refined asphalt. 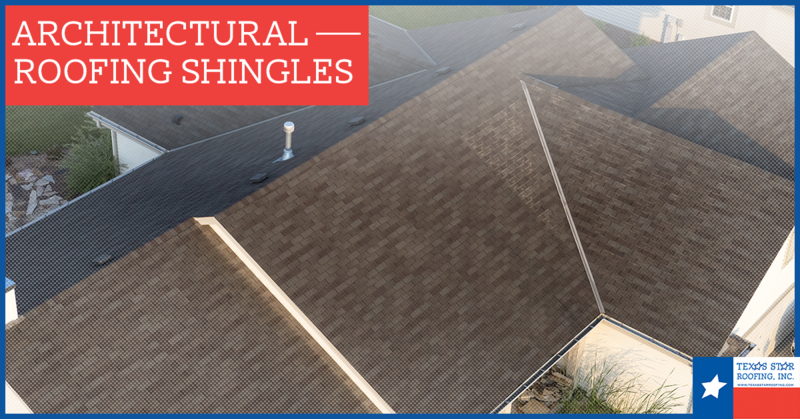 This gives the roof a three-dimensional look, whereas the three-tab shingles lay flat with no additional thickness or layers. Architectural roofing shingles cost more than the tradition asphalt (three-tab) shingles, but the lifespan is much longer. The warranty ranges from 25 to 30 years and wear and tear is outstanding in places with extreme weather conditions. For example, an architectural roofing shingle can withstand wind speeds up to 130 mph because of the additional piece that secures and stops wind from getting up under the shingle, compared to a three-tab shingle which is much more susceptible to damage. 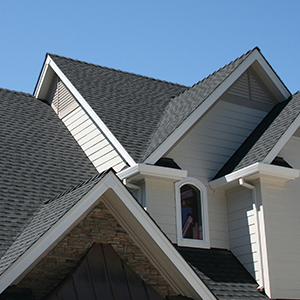 Architectural roofing shingles can stand up next to slate shingles, looking just as appealing. Their three-dimensional display equals slate in aesthetics, but are much lighter weight, which means they don’t require any additional costly, built-in support to the roofing structure to keep them secure. The higher-quality roofing shingles boost your property’s resale value, and hopefully attract a wider audience of home buyers. Texas is known for its extreme weather conditions — constant sun and heat exposure, hard and unrelenting rains, hail, and severe winds (think hurricane season). Investing in architectural roofing shingles might be more of an upfront cost st the time, but may save you money in the long run. If a natural disaster hits or even just a bad storm, this can mean ruin to your roof. Instead of having to constantly replace or repair your roof, architectural roofing shingles are made specifically to weather the worst of storms. They are made for high winds (130 mph) compared to three tab that only withstand up to 60 mph winds. Architectural roofing shingles also help insulate and protect your Texas home from the scorching summer heat, keeping your home cooler and more energy efficient. Here at Texas Star Roofing, we’re here to not only to repair and replace roofs, but help you find the best roofing option for your home. Check out our roofing terminology page to better understand your roofing issue, or our FAQ page for answers to commonly asked questions. And as always, contact us directly for any questions or concerns.